RP: Tempting, but … NO. 6 Responses to RP: Tempting, but … NO. I believe I will allow today’s special celebrity guest handle this one. Ladies and Gentlemen, Will Smith! Take it away, Will! Will Smith: OHHHH Hell NO! P.S.– I’d hate to see his “O” face. Is this from the blind “Daredevil” or the one who predates it? The one who could see? Because that matters here. Early one – check the date. 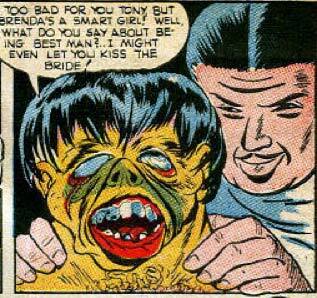 Marvel’s blind man version didn’t start until the early/mid sixties. Anyone else have a craving for some pizza with extra cheese? Does this remind anyone else of Wierd Science?